The lawmakers also point to new evidence of corruption in the United Nations' process for stabilization projects in Iraq. Republican Reps. Jeff Fortenberry of Nebraska, Robert Aderholt of Alabama, and Chris Smith of New Jersey, along with Democrat Rep. Anna Eshoo of California, sent a letter to USAID Administrator Mark Green last week arguing that these communities now face "dire conditions where they desperately need assistance if they are to survive." 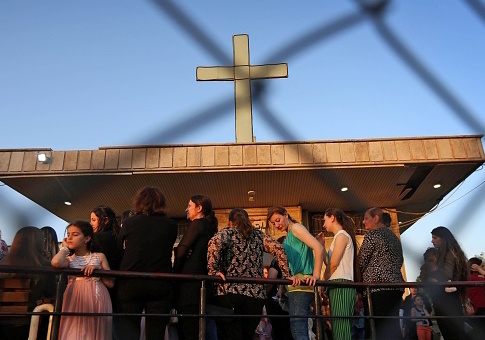 "Returning Christians, Yazidis, and others to their rightful place will reknit the once rich tapestry of pluralism and diversity that existed in the region—an effort that is essential to any hope of durable stability in Iraq and the region," they wrote in a letter dated Oct. 12. The State Department and USAID for years have maintained a "religion-blind" policy when it comes to dispensing aid. They say they distribute the funds based on need and do not give priority to a particular group, even those facing U.S. government-designated ethnic cleansing or genocide. Critics have questioned whether the State Department truly abides by their own "need-based" policies after the United States quickly dispatched $32 million in late September to help the Rohingya, a majority-Muslim group fleeing violence in Burma. A U.S. official told the Washington Free Beacon Wednesday that the State Department and USAID plan to continue their policy of dispensing aid "based on need" and did not address criticism about UN corruption or the funds not appearing to help Christians, Yezidis, and other minority communities on the ground in Iraq. "As the world's humanitarian leader, the United States is committed to providing life-saving assistance to those in need," the U.S. official said. "When providing the assistance, the United States does not discriminate based on race, religion or creed – we provide the assistance based on need." The official also asserted that the "United States has provided assistance that reaches Christian and other minority communities in Iraq, and pointed to nearly $1.7 billion dating back to fiscal year 2014 that the U.S. government has provided to address all the humanitarian needs of Iraqis "both inside Iraq and in the region, including vulnerable members of minority communities, like the Yezidis and Christians." Lawmakers argue that most of the money the United States has provided is directed through the UN, which has little to show for its assistance to these communities. They argue Catholic charities most connected to the communities on the ground are the only groups that have a track record of helping persecuted minorities survive for the last several years and are best positioned to help them return and rebuild. Steve Rasche, an attorney for the Catholic archdiocese of Northern Iraq testified before a House hearing that so-called "completed" school-rehabilitation projects in the towns of Teleskov and Batnaya "take the form of one think coat of painting of the exterior surface walls, with freshly stenciled UNICEF logos every 30 feet." "USAID has an immediate opportunity to partner with entities committee to the appropriate reconstruction of damaged homes and public buildings in several key towns in the Ninevah Plan of Iraq," they wrote. "Timely action would address provisions outlined in the genocide declarations and mirror the current administration's desire to help the survivors," they argued. "Repatriation has a strategic advantage of heading off potential conflict between the KRG and Baghdad while barring an Iranian land bridge to the Mediterranean, which presently threats to fill the vacuum in the Ninevah Plain created by the removal of ISIS," the lawmakers wrote. "This land bridge will be occupied by forces loyal to Tehran if security and rebuilding fails to come from other quarters." "We implore you to review proposals from credible organizations on the ground in the region who are committed to these goals, and if deemed worthy, to move swiftly to empower the through available resources to rebuild the region," they lawmakers wrote. Update Oct. 19, 10:36 a.m.: This post has been updated to reflect comment from a U.S. official. This entry was posted in Issues and tagged Iraq, ISIS, USAID. Bookmark the permalink.